Blocking streets, particularly T-intersections at entries to malls or pedestrian ways. Protection at pedestrian crossing areas where pedestrians approach the verges and come in to conflict with the vehicular environment. Protection of vegetation areas: In high-use pedestrian areas this may require additional barrier fencing. Protection of existing buildings or trees in close proximity to traffic zones. Due to regulations this usage is typical in older traditional areas of cities where space is at a premium and not designed for modern traffic conditions. 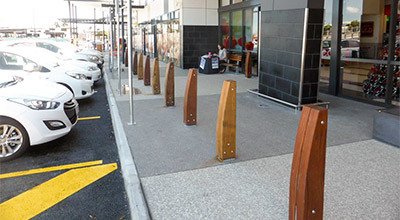 Urban bollards need to maximise visibility to ensure they are readable marker elements in the landscape. Mass, size, and a strong graphical design will assist in readability by allowing pedestrians to visually construct images from glimpses through the pedestrian environment. When moving in controlled footpaths the rigid structure and urban language informs and regulates pedestrian behavior. When these restrictions are lifted and the true urban market comes into play (with its myriad of options and locations), it is observed that pedestrian traffic has a chaotic and random tendency in contrast to the rigidity of vehicular movement. The purpose of bollards is to mediate these two states by acting as a permeable threshold to the pedestrian zone. The transition through this permeable boundary, for example to a pedestrian zone, creates a sense of safety and welcomes the pedestrian into an environment that is free from the constraints imposed by the conventions of kerb and vehicular movement. Please contact OSA with any questions on our urban bollard range.